Experts and users continue to make the Coway AP-1512HH the best small air purifier for most people. For big spaces, the Coway Airmega 300 is tops. We also cover air purifiers that perform nearly as well, air filters for whole-house heating systems, and discuss what type of air purifier to avoid at all costs. Specs that Matter HEPA filter -- Yes Room size -- 326 sq. ft. Dimensions (w,h,d) -- 16.8" x 18.3" x 9.6"
In expert tests and user reviews, the Coway AP-1512HH Mighty excels at particle, pollen and smoke removal. It doesn't have the largest capacity, but with the ability to clean air in rooms of up to 326 square feet, it can handle all but the largest master bedrooms. Speaking of bedrooms, the Coway is among the quietest air purifiers in testing, "effectively silent" at its lowest setting one top expert reports. Good durability and low long-term ownership costs are pluses, too. Specs that Matter HEPA filter -- Yes Room size -- Up to 1,250 sq. ft. Dimensions (w,h,d) -- 21.2" x 18.3" x 13.6"
It's overkill for a bedroom, and loud at its high speed, but if you live near a highway, or want an air purifier for an oversized space, such as a great room, the Coway Airmega 300 is a top choice. With twin filters, including a true HEPA filter, it can clean spaces of up to 1,250 square feet, or handle smaller rooms with exceptionally dirty air, and deliver essentially the same air quality as the smaller-room Coway AP-1512HH Mighty (Est. $225). Furnace filters cost significantly less than air purifiers, and experts say they can be just as effective for most people. 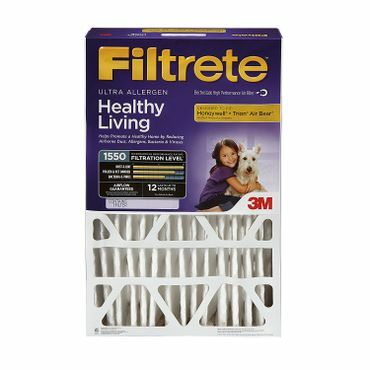 The Filtrete Healthy Living 1550 is one of a series of Filtrete filters designed to remove coarse to fine particles from air distributed by a hot air heating system and/or central air conditioning. The 1550 gets very high ratings in professional tests. Users like them, too, and many say that they effectively help reduce allergy symptoms. If you suffer from allergies, asthma or any other condition that's made worst by airborne particles, a room air purifier may provide you with some -- or quite a bit -- of relief. People who smoke or have pets also like them for reducing odors, as well as removing smoke and pet dander. Some portable air purifiers use mechanical filters to clear the air, others use an electrical charge. Both technologies are discussed in more detail below. Rather than purifying air one room at a time, another alternative is to consider a whole-house furnace filter. These aren't air purifiers; they simply replace your regular furnace filter. Most filters of this type do a pretty decent job of removing dust, pollen and smoke. Whole house filters need to be replaced every three months otherwise their airflow could be reduced, which makes them less effective. On the plus side, they don't use power and hence are less expensive on a yearly basis than any room air purifier. In reviewing air purifiers, we discovered that the most satisfied customers are those who understand the limitations of an air purifier and adjust their expectations accordingly. Portable air cleaners can remove only airborne pollutants, they are not very effective against dust mites and their droppings (those are too heavy to be airborne for long), which are a significant allergen for many people. Most air cleaners also don't remove chemical gases or strong odors (see below for more information). Instead, air purifiers are most effective on particles larger than 0.3 microns, such as molds, pollen, dust, plant spores, pet dander and the larger particles in cigarette smoke. Air purifiers do their work using different technologies, and some use multiple technologies, to deal with airborne pollutants. HEPA air purifiers use pleated high-efficiency particulate arresting (HEPA) filters to mechanically trap particles, along with a fan to pull air through the filter. Reviewers say this type of air purifier is by far the most effective. These models don't produce any ozone, either. Because they use fans, they can be noisy, but some actually like the sound an air purifier makes, likening it to a white noise machine. Not every air purifier that relies on mechanical filtration uses true HEPA filters, so be sure that you are getting that technology if that's what you decide you want. Some air purifiers use electronic technology in place of or in addition to a mechanical filter. Electronic ionizers work by reversing the charge of particles in the air. The charged particles are then passed back out to the room where they are attracted to objects such as clothing, walls, floors and furniture. In effect, particles are removed from the air and deposited on your furnishings and clothing. You need to dust and vacuum to actually remove allergens from the room and prevent them from being reintroduced into the air. Some air purifiers have an electrostatic precipitator that works by putting a charge on particles and then collecting those using oppositely charged metal plates. While both types of electronic air purifiers are effective, they can also produce a small amount of ozone, a lung irritant, though typically at levels below the standard set as safe by Underwriters Laboratory and by government agencies. Some electronic air cleaners put a small charge on a mechanical filter to help it collect particles more effectively. With that type of air cleaner, the charge is low enough that measurable amounts of ozone are not produced. Ionic and electrostatic air purifiers emit small amounts of ozone as a byproduct, but ozone generators sold as air purifiers emit high levels intentionally to neutralize chemical irritants and odors. Research has shown that, while this can be effective, it's also fairly dangerous. The best advice we found is to avoid ozone generators altogether. For more information, see our discussion of air purifiers and ozone elsewhere in this report. As noted above, with the exception of ozone generators, none of these mechanical or electronic air purifying techniques are particularly effective against chemical gases or strong odors. Some air purifiers add some type of chemical filtration -- typically activated carbon -- to deal with those irritants. The most effective of those sell for a premium price compared to the majority of air cleaners, but if you suffer from chemical sensitivities, they might be worth every penny … or not. For its part, Consumer Reports notes in its review that "Some portable models with carbon pre-filters are claimed to filter VOCs, but the Environmental Protection Agency warns that such filters are specific to certain gaseous pollutants, not for others, and that no air purifier is expected to remove all gaseous pollutants found in the typical home." Furthermore, in a free article elsewhere on the site, Consumer Reports' Mary H.J. Farrell says that "unless you have allergies, you probably don't need [an air purifier]." "Don't Spend Money on an Air Purifier You May Not Need"
To find the top performing air purifiers, we consult professional reviews, such as those from Consumer Reports, Wirecutter, TechGearLab and Top Ten Reviews. We also consider whether or not an air purifier has been submitted for testing and has had its ratings certified by the Association of Home Appliance Manufacturers (AHAM). Rounding things out, we analyze the hundreds and sometimes thousands of user reviews some air purifiers have garnered at sites like Amazon, Allergy Buyers Club and elsewhere. The feedback from Wirecutter as well as by users proved to be particularly important in our evaluations, because, as discussed below, it revealed that some well-regarded air purifiers that looked like winners at first don't stand the test of time all that well. Armed with that information, we consider factors such as performance (including long-term performance), ease of use and noise. Finally, we analyze the full cost of the unit, which includes both the initial cost and the ongoing costs of filter replacement. The results of that research helps us to narrow down our recommendations for the top air purifiers for any space or budget. For this edition of our report, we are going to maintain the Coway AP-1512HH Mighty (Est. $225) as our Best Reviewed pick. 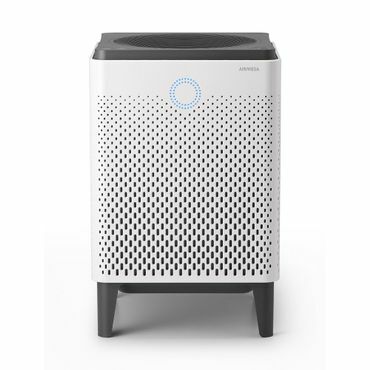 This HEPA air purifier is currently the top pick at Wirecutter, the Editors' Choice at TechGearLab, named best overall by Top Ten Reviews and gets generally strong user reviews (see more below). This Coway air cleaner is rated for rooms up to 326 square feet, making it suitable for all but the largest master bedrooms. It's quiet, too, measuring only 51 dB (at a moderate setting) in Wirecutter's test -- "far quieter than a typical conversation," John Holecek and Tim Heffernan report. At its lowest setting, this air purifier "is effectively silent on low at 42.7 decibels." Top Ten Reviews cranks things up to the AP-1512HH's highest setting and measures noise at a not-overly-disturbing 58 dB -- lower than the generally accepted noise level of conversational speech or a room air conditioner, both of which weigh in at around 60 dB. TechGearLab says that its testers had no problems watching TV with the air cleaner running at that highest setting. That all wouldn't matter if the air purifier wasn't a capable performer, but it is -- "reducing particle concentration to just 12 percent background level after 20 minutes," Holecek and Heffernan say. A couple of other unit's in Wirecutter's test performed a little better -- one beats it by a statistically insignificant amount, but has higher operating costs, while the other performs significantly better, but comes with some long-term reliability concerns (see below). At TechGearLab, Max Mutter and Steven Tata report that "This beast of a machine was able to filter out 99.34% of airborne particulates after spending half an hour in our hazy, 150 square foot testing room." They add that that was better than what most of the other models they tested could accomplish in a full hour. The Coway looks to be extremely durable, a not insignificant plus. User reviews of units that failed prematurely or arrived non-functional are not unheard of -- and Coway's customer support is not well thought of by those who encountered issues -- but are also relatively limited compared to owners who report excellent performance. And that performance stays strong over the long haul. Wirecutter is impressed: Though the HEPA filters have only a one-year stated lifespan, "We ran our test model virtually nonstop for two years without replacing them—twice what's recommended—and it still worked as well as it did on day one." Another plus for some is that the Coway is also quite a bit smaller than many air purifiers, measuring 16.8 by 9.6 by 18.3 inches. The unit is available in either glossy black or glossy white with a contrasting accent ring, which is a welcome departure from typical air-purifier styling. If you need something that can handle a little larger room -- up to 465 square feet -- the Honeywell HPA300 (Est. $200) also gets good feedback. It's not been tested by Wirecutter, but it is the third highest rated air purifier at Consumer Reports, where it is a Recommended model. This HEPA air purifier is effective at removing dust, pollen and smoke, especially at high speeds, though it's also a very good performer at low. Noise levels are middling -- rated good at both high and low speeds. The editors add that the unit is not especially quiet, but is among the quietest air purifiers at high speed. The HPA300's up-front costs are lower than the Coway, leading Top Ten Reviews to name it a Best Value choice, but while both models meet Energy Star standards, the Honeywell's total energy consumption is higher (127 watts vs. 79 watts). On the plus side, the Honeywell HRF-R2 True HEPA Replacement Filter (Est. $35 for two filters) and Honeywell HRF-AP1 Filter A Universal Carbon Pre-filter (Est. $6) are relatively reasonable in price. Another plus is a five year warranty, which Top Ten Reviews reports to be "the longest available among air purifiers." User feedback is largely excellent, as well with a rating of 4.3 stars based on well over 1,600 reviews at Amazon, and even better ratings (albeit based on far fewer reviews) elsewhere. Most are pleased with overall performance. We did see a number of comments that the unit was a bit loud, but other owners say that it's fine in that regard. 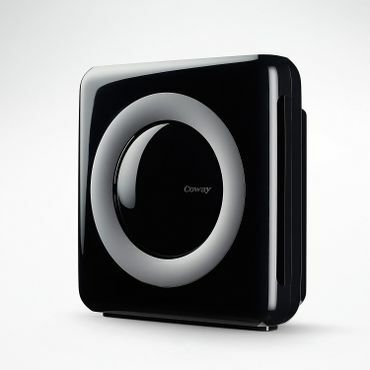 Both of the above air purifiers are good choices for most rooms in your home, but if you need to purify the air in a very large room, or have exceptionally dirty air, the Coway Airmega 300 (Est. $450) is a top choice. It gets a middling review at Consumer Reports, as the testers there find that, while it is very effective when operating at high speed, it doesn't do very well at low speeds. However, it's the step-up pick at Wirecutter. "With a pair of filters, the Coway Airmega 300 is rated to clear spaces as large as 1,250 square feet and will keep smaller spaces exceptionally clean even on the lowest setting," Holecek and Heffernan say. For locations with particularly bad air -- near a highway for instance -- this HEPA air purifier can be set to filter the air in a space up to around 625 feet four times an hour. User feedback isn't extensive, but is fairly decent -- 4.3 stars at Amazon based on nearly 100 reviews, for example. Considering its power, noise concerns are minimal. Consumer Reports says that it's one of the quieter air purifiers it tested at high speed. Wirecutter says that performance at the two levels below the top speed is terrific, and that noise at those settings is below 55dB. The Airmega is loaded with cutting edge features. It can be set to monitor the air quality, sharing that information with you via an LED ring. It can also be set to adjust the fan speed and filtration rate based on those readings, and to shut itself off if the air quality measures "good" for 10 minutes or so. A sleep mode reduces fan speeds when the air quality is good for three minutes for quieter operation while you are sleeping. If all of that isn't "smart" enough, there's a Wi-Fi enabled, version of the Airmega, the Coway Airmega 300s (Est. $650), that works with a proprietary app. The app lets you remotely monitor the air quality in your home (or at least in the room where the 300s is located) and can send you real-time updates. It can also give you the condition of the filter, let you remotely program the air purifier's timer and more. However, experts are pretty lukewarm about that smart functionality and the app earns few raves. "We actually tested a 300S; six attempts to get the app to work failed," Wirecutter says, and it generally doesn't fare that well in the usual tech publications, such as PCMag, that focus on the smart features of devices such as this. For their part, Wirecutter questions the utility of any "smart" air purifier, and considering the price premium that Wi-Fi connectivity and access to the app adds to this already pricey model, this is one case where we certainly agree. If the Airmega 300 is the right call for your situation, save your money and get the base, non-connected, version as it will clear the air every bit as effectively. While we saw pretty good user feedback for the 300s last year, that's declined, for example to a middling 3.9 stars based on just over 100 reviews at Amazon. The Blueair Blue Pure 211+ (Est. $250) is another option for a big room, but one that comes with a pretty big caveat as at least one expert frets that there could be a significant drop off in performance over time. While the Pure 211+ has yet to be professionally reviewed (at least by any expert we deem credible), extensive test results are available for this air cleaner's predecessor, the Blueair Blue Pure 211, which is identical save for the addition of a foldable carbon filter, ostensibly to reduce low levels of odors, VOCs and gases -- but see our comments regarding the effectiveness of that type of filtration in the introduction to this report (above). Regardless, we expect that performance should be identical when it comes to filtering out particles from the air. At Wirecutter, testers found that the Blue Pure 211 is the most effective room air purifier overall, even besting the Coway. However, the reviewers raise durability concerns after another, previously top-rated air purifier made by the same company, the now-discontinued Blueair 503, saw its performance collapse "over the course of just two years of use, and remained poor even after replacing the HEPA filters and cleaning the machine thoroughly." Because the Blueair Blue Pure 211 uses the same charging technology as the 503, Holecek and Heffernan say they can't recommend either air purifier. However, it's also worth noting that the Pure 211 (and 211+) does have a pre-filter, something that the 503 lacks, and something that some users say is the real root of some of the 503's reliability issues. That may be true as feedback for the 211+ is fairly solid thus far, including a 4.3 star rating at Amazon based on nearly 200 reviews. Another source of comfort is that Consumer Reports' testers have no qualms regarding the Blue Pure 211. It's the top rated air purifier there, and it also receives a Best Buy recommendation. The editors find that it's excellent at removing dust, smoke and pollen at both high and low speeds. Where other air purifiers have replaceable pre-filters, this model has a washable fabric one, and that gets a thumbs up. The pre-filter is available in five colors to fit a variety of decors. The main filter uses mechanical and electrostatic filtering technologies to capture particles, and the unit alerts you when it's time for that filter to be changed. The filter is HEPA-type rather than true HEPA, but its air-cleaning performance has been verified by the AHAM. Its coverage rating is lower than the Coway, and is best in rooms of 400 to 600 square feet. TechGearLab is also impressed by the performance of the Pure 211 it tests, saying that it had the most power of any unit it reviewed (though they didn't look that the Coway Airmega 300), but that's counterbalanced by its operating costs, with the editors noting that at an estimated $1,105 over its lifetime, it had " the highest lifetime cost we calculated by far, and took the Blueair out of contention for our Editors' Choice Award."